Are you trying to decide which are the best wireless routers on the market today? Do you have trouble understanding all the different wireless standards and the varying speeds that go with those standards? 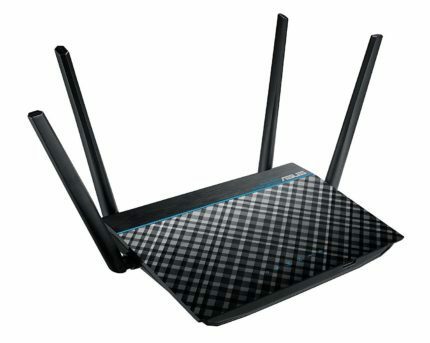 There’s nothing to be ashamed of if you answered yes to any of those questions; the truth of the matter is that there are so many different options, features, speeds and wireless standards available that understanding what the best wireless routers for home use are can be extremely challenging. On top of all these different options and features that are available, there is the big difference in price. A wireless router can range from just $30 and go all the way up to $300 or more. With such a big price difference, how do you know which router is right for you and whether to spend that little bit more for a couple of other features? The table below lists the best wireless routers for the all-around use available right now. In case you’re looking for a wireless router for gaming mainly, head over to our best gaming router buyer’s guide. These wireless routers have been chosen carefully based on a combination of their features, their compatibility with wireless standards and their price. Using the table below you can get a quick overview of the different wireless routers that are available today and decide which one is best for you. The only true way to establish which wireless router is best for you is to get out there and do some research. There are so many different makes of a router and there are so many different models of router out there. Each make and model have different features, different levels of performance and of course a differing price tag. The best way of getting through this jungle of options is to detail all the routers and then line them up side by side in terms of their performance. Luckily, we have done all this work for you – we have carried out a comprehensive review to determine the best wireless routers on the market today. We have detailed the wireless standards that each model of wireless router supports as well as their respective speeds and we have grouped them together in table form so that you can get a quick overview of each router in comparison to the other. We have also carried out a comprehensive review of each of the wireless routers that we picked as being among the best. We have detailed the features offered by each router as well as discussing how they perform in the real world and then moving on to list their good and bad points. The table above shows our top expert recommendations for the best wireless routers of 2018. Well, without wasting any more time, let’s jump right on our list of the best wireless routers out there. 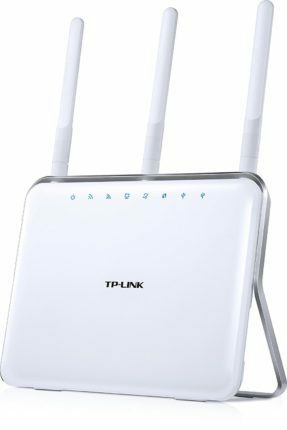 The TL-WR841N wireless router from TP-Link is a very robust router that is suitable for many standard home setups as well as for small business setups. Whilst this router does not come with as many features as some of the other wireless routers available on the market it does come with everything that you need to get your devices on to the Internet. This wireless device is backward compatible with 802.11b/g products and as such, it works with almost any wireless-enabled device. The device also comes with an Easy setup assistant tool which makes the device very easy to configure in terms of connecting to your broadband modem and getting your devices connected to the TP-Link router wirelessly or by cable connection. The device does come with several useful features including parental control – so that you can restrict the types of websites that your children can visit – and IP bandwidth control so that you can restrict the amount of data that various connected devices can consume. The wireless router also comes with a WPS button so that you can set up WPA/WPA2 wireless devices using push button technology – this is great for devices such as printers where there isn’t always the facility to enter network keys and set up the wireless using traditional methods. The TP-Link TL-WR940N is a great mid-level router that comes with some exciting features whilst still being set at a reasonable price point making it affordable for home use. We have rated this as the best mid-level router because we felt like this router gives you the largest number of features, the best range of compatibility between devices and the fastest speeds without going to the top-end of the market and spending a higher amount. This TP-Link wireless router supports 802.11n/b/g standards and when using the wireless N standard (Supported by most modern wireless devices) the router can reach speeds of up to 450 Mbps – Once again this is very fast considering the price point of this router. These speeds make the TL-WR940N ideal for any tasks that require a lot of bandwidth, for example, the wireless router is great for anyone that wants to do HD video streaming, VOIP calling or video gaming. Furthermore, the router also comes with 3 external antennas which give the wireless signal a boost and ultimately allow you to pick up a decent Wi-Fi signal from further away than some other routers. This is great if you live in a big house or there are obstructions between the locations of your router and your other connected devices. The router offers several useful features including IP bandwidth control, WPS push button for one-touch wireless connection setup and parental controls to manage Internet access in children’s or employees’ computers. As with all TP-Link routers you are also covered by a reliable 2-year guarantee and 24/7 technical support from TP-Link themselves. 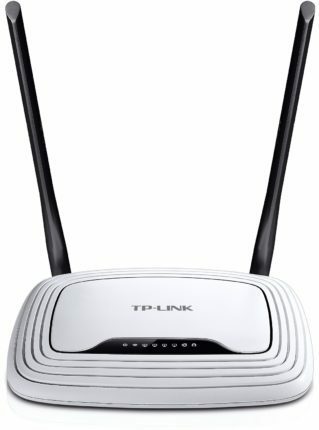 One thing to look out for if you are considering the TP-Link TL- WR940N is the different versions that are available – only version 3 (V3) of this model supports 450 Mbps where earlier versions only support a maximum speed of 300 Mbps, so when purchasing just look out for the version number beforehand. The Nighthawk is one of the best wireless routers that we have reviewed. It ticks all of the boxes that a solid router should tick – it is extremely well built, it is very fast and it has lots of features. In addition to these points, this wireless router is exceptionally reliable and stays connected where many other routers have occasional dropouts. The Netgear AC1900 wireless router offers extremely fast wireless speeds thanks to its dual-band wireless modes and offering a staggering 600+1300 Mbps speeds. These speeds are achieved because both of the wireless bands within the router can each have their own independent share of the wireless data traffic meaning it can handle twice as much as a typical single band router. Unlike many other wireless routers, the Nighthawk also has a powerful dual-core processor which means that the router itself can handle a very high volume of traffic from multiple connected devices. This dual-core processor means that the router never struggles no matter how much work it has to do. It also has one of the most comprehensive wireless protocol ranges, supporting 802.11 a/b/g/n/ac. One of the really interesting features on the Nighthawk is its support for open source software. 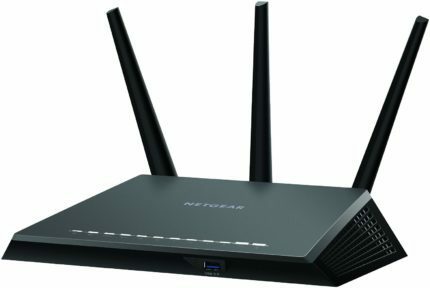 If you are Interested in getting right underneath the bonnet of your home router then you can install open source firmware on this Netgear model which gives you a much more flexible interface for the router and allows you to change many more features than with the normally closed source variant. Overall this router ticks all of the boxes, it does a fantastic job of being a wireless router and it also has loads of features for the more advanced users out there. All of this coupled with the fact that it is not overly expensive to make it one of the best wireless routers on the market today. The Archer C9 by TP-Link is a real gem when it comes to wireless routers. The great thing about the Archer C9 is that it doesn’t show off when it comes to looks – it looks like a standard router and you might not expect it to pack that much of a punch. But you would be wrong to think that – it is packed with speed and useful features and its up there with the best of them. Let’s talk about wireless speed first – The C9 has a dual-band wireless receiver with one band offering 2.4Ghz and the other offering 5Ghz. This provides 600Mbps on the 2.4Ghz band and 1300Mbps on the 5Ghz band which combined gives you a total bandwidth of 1900Mbps – very impressive wireless speed for such an understated wireless router. The Archer C9 comes with its own app – available for both iOS and Android devices – which allows you to easily access all your wireless router settings from your phone or tablet device. This means you can make configuration changes or simply tether new devices easily using the app. The TP-Link router comes with two USB ports – one running at the standard 2.0 speed and the other running at the higher USB 3.0 speeds. These ports allow you to plug in your media sticks – USB drives and so on – and then share the data contained on those devices over your network. This is great if you want to stream music or video to devices around your house or even for sharing files between computers wirelessly. Because of its 5Ghz wireless band, the C9 wireless router is perfect for video streaming. We tested it with a 4K ultra HD video and we could stream it wirelessly without any lag or delays. This is very impressive and once again looking at the router you would not think it had this much wireless power. The router only comes with a single core processor which is rated at 1Ghz, however, this chip seems to have ample power to control several devices simultaneously. Other features on the C9 include Beamforming technology to improve wireless signal strength and avoid drop-outs, 3 detachable high-performance antennas for maximum wireless coverage and reliability, 2-year warranty and 24/7 tech support from TP-Link. Finally, we should mention the design features of the TP-Link C9. The profile of this wireless router is very minimal. It has a very slim design and a light-weight bracket on its base, allowing the router to stand upright. This means that you can have the router sitting right in the corner of your shelf or cupboard and thus it is ideal for homes where you don’t have much space, or you simply don’t want your wireless router taking up lots of room. The design is also very minimal with a simple white facia along with a few discrete status lights. If you want your router to stand out and look flashy then this model isn’t for you, but if you want a discrete design that you can tuck away in the corner and just let it do its job then the C9 is a perfect choice. The ASUS RT-ARCH13 is an extremely powerful piece of kit and up there with the best wireless router. The RT-ARCH13 offers a dual-band Wi-Fi link as well as the latest MU-MIMO (Multi-User Multiple Input, Multiple Output) technology. The MU-MIMO technology allows the router to send the Wi-Fi signal directly to each device instead of forcing other clients to wait for their turn after the main device, like it works with the standard routers. However, apart from the router, the connected device has to be MU-MIMO compatible as well in order for it to benefit from the technology. Furthermore, the ASUS RT-ARCH13 router only supports 2×2 dual-band which means maximum two devices can benefit from the concurrent Wi-Fi speed. When a third device is connected, it shares the bandwidth just like it’s the case with regular routers. In case you have more than two devices that need fast connection, consider a router with 3×3 or 4×4 dual-band capacity. 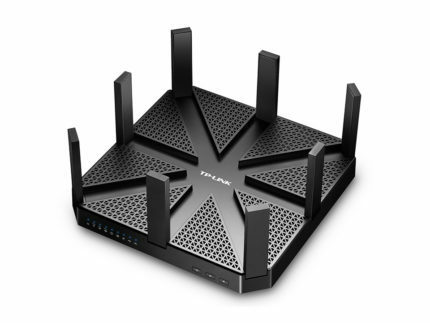 The Asus wireless router comes with its own app that allows you to monitor the router as well as managing the devices that are connected to your local network. The app can be installed on iOS and Android devices and allows you to take full control of your network and your router directly from your phone or tablet. The router comes with 1 USB 3.0 port which allows you to plug in and share an external device such as a USB storage drive. You can share the media or data from the device with all computers that are connected to the network – because it is USB 3.0 you can enjoy super-fast data transfer speeds as well. The RT-ARCH13 comes with a dual-band wireless setup that employs the latest MU-MIMO technology to deliver super-fast wireless speeds to multiple connected devices. 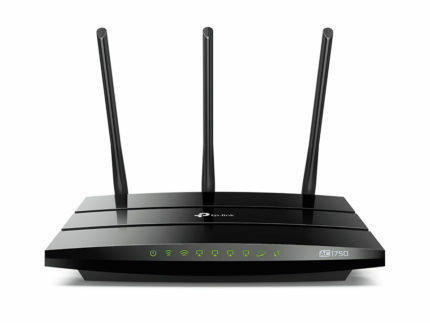 Using the dual-band, you can get a combined speed from this wireless router of up to 1267Mbps. The router also comes with an easy wireless router setup wizard which is called ASUSWRT and is a web-based interface. This wizard makes the router very easy to set up and get your Internet line connected. When it comes to design, we were undecided with this one. If you want a wireless router that looks snazzy and stands out, then the design of this router is perfect for you – the router has a crisscross design along with blue trim that makes it look modern and stand out. We did find that the bold design can look out of place in some settings – depending on the surrounding furniture. So, design is definitely a personal preference when it comes to this Asus wireless router. The TP-Link Talon AD7200 is probably the biggest and boldest router that we have ever come across, but did its abilities match up to its looks? The answer to that question is an easy yes – everything about this router just screams power, speed and abilities. The router has supreme wireless signal strength thanks to an astonishing 8 fixed antennas. The antennas ensure that you can send and receive data over a strong wireless signal no matter whereabouts you are in relation to the wireless router. In addition to the vast array of antennas, the AD7200 also boasts 4-stream Wi-Fi in the form of 2 5Ghz bands and 2 2.4Ghz bands. The multiple Wi-Fi bands allow the router to push out a total of 7200Mbps in bandwidth which is the most that we have come across in any wireless router. 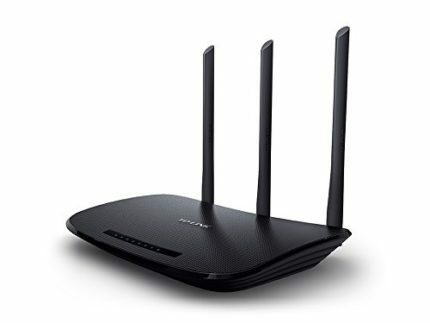 The router also supports the latest wireless standard 802.11ad so you can guarantee that if you are using modern wireless-enabled devices you are going to be connecting at the highest speeds possible. The downside to this is that if you have older wireless devices we found that sometimes there can be connectivity issues. This router is great for video streaming and will cope with high definition 4K videos without any issue at all. The Talon has one of the best processors inside it as well – it has a dual-core processor which operates at 1.4Ghz. This is very fast compared to your typical single-core router processor and it means that the device can handle many simultaneous connections as well as other tasks such as media sharing without any issues at all. In addition to its fast processor, the router also comes with 512MB of RAM and 32MB of flash memory. This makes it almost as powerful as some computers and it really does pack a punch. This router can easily handle concurrent connections from 20 or more devices as well as handling multiple operating simultaneously including local network traffic, Internet requests, video streaming and media sharing across both wireless connected and physically connected devices. That brings us to the media sharing abilities of this router which are also impressive. The AD7200 comes with 2 x USB 3.0 ports so that you can share all your media including video, music and files across your network. USB 3.0 connectivity coupled with the super-fast wireless bands ensures that you can share and stream this media without any delays or lags and the dual USB 3.0 ports mean you can have multiple devices plugged in and shared out at the same time. 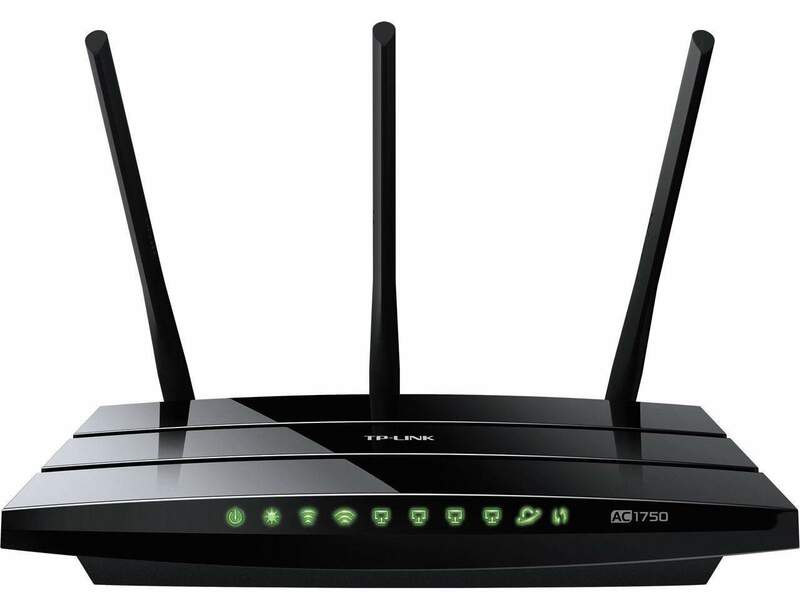 To top it all off with this router you also can set up and configure your own VPN network allowing you to connect in remotely to your network without any worries about your private data becoming intercepted or compromised. The router comes with a very acceptable 2-year warranty agreement which tells us that it is very well made and the manufacturer are happy to back that up with a warranty longer than that offered by most other routers. In addition to this warranty, the support offered for this product is also very comprehensive. TP-Link provides a 24/7 toll-free support line that you can call for any issues that you have with your router. The support line even covers the setup of your router and not just for setting up the device after you have purchased it but at any point in the future. TP-Link state that it does not matter when you purchased your product, if you have the router, you can call the support line for help with setup. We couldn’t rate this as the best wireless router due to its cumbersome design, many antennas and high price tag but those points aside this was one of our favorite routers to test. It really is as impressive as it looks and it has some serious power and performance. The Linksys WRT54GL wireless router is classed as an entry level router because it has a limited capability in terms of speed and features. It is built primarily for home use and whilst it does not have as many features as some other routers it does do its job very well. If you simply want to get your home connected to Wi-Fi, then this router is perfect for you. The WRT54GL supports a maximum Wi-Fi speed of 54Mbps which is slow compared to some other routers but it is still very reasonable. When you consider that many homes have an Internet speed of far lower this router provides plenty of bandwidth for the typical home user. The big plus point with this router is its design – it looks and feels like a router should, it doesn’t have too many fancy antennas, it doesn’t have a big cumbersome footprint and it isn’t trying to be something it’s not. In addition to its design, this router really has stood the test of time – it has been around, in various forms, for many years (In fact it was first released in 2005) and over the years has proven its worth repeatedly. The device is based on the Linux operating system which makes it extremely secure as well as being very easy to customize – because of course, the Linux operating system is open source software. This means that if you are so inclined you can get under the bonnet of this router and start changing settings and features as you see fit. You can also get more third party support and add-ons for this router, again because of its open-source operating system. 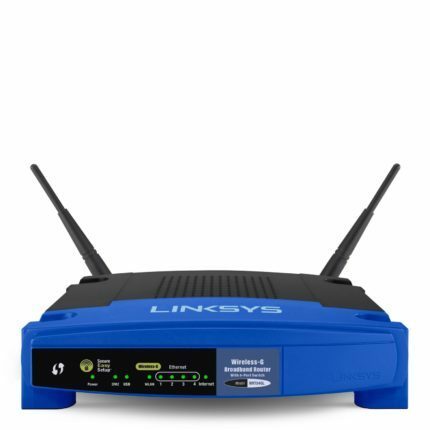 The Linksys wireless router supports WPA2 wireless encryption to ensure that any data you transmit over wireless is completely secure and safe from hackers. It also comes with a built-in SPI firewall for added security. The router comes with an easy to configure parental controls feature which allows you to restrict Internet access based on specific categories and/or web addresses. This is ideal if you have kids and you want to prevent them from visiting certain websites. As well as the wireless interface, the WRT54GL also has 4 Ethernet ports for connecting devices to your network via cable. Although these ports only operate at 100Mbps they are once again more than sufficient for a small home-based network to operate at a decent speed. The downside with this router is that it only uses the 802.11 g Wi-Fi standard – and this has since been superseded by 802.11 n and 802.11 ac. The wireless router also operates on the 2.4GHz frequency band which has also been changed or upgraded in some other newer routers. The router only operates on a single band as well. These factors are what limit the router’s maximum wireless speed to 54Mbps. Despite those weaker points, you must consider that the router has been around for 11 years and is still going strong. The reason for this is simple; the router is a very robust piece of equipment, it is sturdy, long lasting and neat in its design making it ideal for many home users. In summary, this is the best wifi router for home use if you have a home Internet and you want to connect 4 or 5 devices at a reasonable speed. If, however, you have more devices to connect, you have Internet speeds of over 100Mbps or you are looking for some more advanced features then you may not be happy with this model. The AC1750 from TP-Link is a very powerful model when it comes to wireless speed and performance. The router comes with a dual band Wi-Fi system as well as Gigabit connectivity. The Dual-band Wi-Fi can deliver a total throughput of 1.75Gbps (1750Mbps). This bandwidth is delivered via the two bands – 450Mbps at 2.4Ghz and 1300Mpbs at 5Ghz. This means that you can get very fast wireless speeds from the router but it also means that the wireless device can handle a lot of devices connected concurrently as well as supporting video streaming and other forms of data routing such as media sharing across your local network. The router also comes with 4 Gigabit LAN ports which means that as well as connecting many wireless devices you can also connect to 4 cabled devices to the router itself – this is most suited to home computers and laptops where you can physically connect a cable from the device to the router. Being Gigabit ports you can expect 1000Mbps in bandwidth from each port which is faster than most typical routers which operate on 100MBbps LAN links. The Archer C7 also supports the most modern wireless standards in the form of 802.11ac which allows you to get top performance from all your modern Wi-Fi gadgets that operate using these standards. Older devices will also work fine thanks to the backward compatibility that this router offers. This is a feature that we don’t see in enough wireless routers. Guest network access allows you to create a separate wireless network that comes with its own security key. You can give this key out to friends and visitors so they can get access to your Internet without accessing your home network. The guest network is segregated from the rest of your network so that none of your connected devices will be able to communicate with the guest devices and vice versa. This keeps your personal information safe and is a great security feature. The C9 also offers IP-based Bandwidth Control so that you can manage the available bandwidth on your network. If you are doing some intensive tasks such as streaming HD video, then you can restrict the available bandwidth of other devices on the network so that you don’t face any performance degradation. The wireless router offers a very easy wireless setup thanks to its one-touch WPA wireless security encryption. Simply push the WPS button on your router and you can connect other devices that support WPS wireless connections with almost no effort at all. TP-Links Easy Setup Assistant provides quick and easy installation of the router, broadband link, and device configuration and even comes with multi-language support. This is probably the best router under $100 in 2018 that we have reviewed and it really is great value for money. 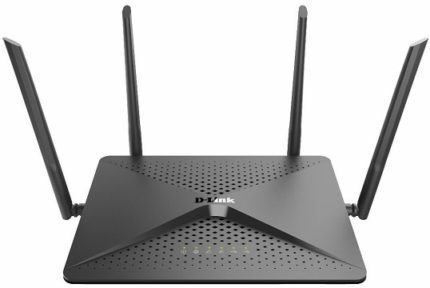 Last but not least, the D-Link DIR-882, which is a dual-band Wi-Fi router packed with some nifty little features and a very impressive wireless and wired network performance as well. The AC2600 offers a total bandwidth of 2533Mbps thanks to its dual-band wireless system – that’s 800Mbps available on its wireless N band as well as 1733Mbps available on its wireless AC band. Because of its performance and reasonable price tag it acts as a great gaming router for the money. The speeds available with this wireless router provide a great experience when streaming 4K video as well as other forms of media. The wireless router from D-Link also comes with beamforming which enhances the already fantastic wireless signal strength so that you can ensure all your devices always get maximum share of the wireless signal throughout your home or small office. Thus, this was the best wifi router for long range out of those that we reviewed. The router comes with Gigabit WAN and LAN ports for high-speed wired connections which can operate up to 1000Mbps. The router comes with two USB ports as well allowing you to connect, and stream from, storage drives and allows you to connect and share out other USB devices such as printers. Thanks to its four high power antennas with up to four data streams and 160MHz bandwidth support, the D-Link AC2600 DIR-882 is the perfect wireless router for the multimedia families as you can play online games on one device and stream 4K videos on the other without any lag penalty whatsoever. Smart connect QOS technology always ensures that every device you connect to this router gets the fastest possible link and performs to the best of its capabilities. This router also comes with WPS push button setup so that with any supported devices you can connect them to the wireless network with a very little hassle. With push-button setup, you can simply push the button on the wireless router and then initiate WPS connection on your device within a certain timeframe for it to be safely connected to your network. This is a great feature if you want hassle free wireless setup but also great if you have any devices in your home that only support WPS push-button setup – such as some wireless printers. When you are searching for the best wireless router there are a few key features that you should understand so that you can make the best buying decision. Because there are so many different features offered depending on which wireless router you look at it is important to understand what the different features are, what they mean and whether you need them. Wireless standards are mentioned on almost every wireless router that you will look at and they come in a similar format across the board and follow this pattern: 802.11 followed by one or more letters, like for example 802.11a. 802.11 is the number of the IEEE standard that groups all the different wireless technologies together, the letters that come after this number are the important part to look out for when comparing routers. The most common letters that you will see when looking for the best wireless routers are “a” which supports bandwidth of up to 54 Mbps, “b” which supports bandwidth of up to 11 Mbps, “g” which supports bandwidth of up to 54 Mbps, “n” which supports bandwidth of up to 300 Mbps and “ac” which supports bandwidth of up to 450 Mbps. There are other wireless standards in addition to those mentioned above, but they are the most common ones. It is important to understand that some wireless routers are dual-band meaning that they produce more than one wireless signal. Some routers have more than two bands and thus they can produce much faster speeds and/or additional bandwidth capabilities. For a comparison, the typical home PC with a local area connection (Physical connection to the router) would operate at 100 Mbps so the general rule of thumb is that anything over that will be sufficient for most users. However, if you are a gamer, you are streaming video or you have multiple users in your household then the higher the advertised speed and bandwidth of the wireless router the better. The general rule is the more features there are on a router, the higher the price, so if you don’t see yourself using these features then go for a cheaper model that does not advertise them. Because most households today have a broadband connection and therefore need a wireless router they are readily available in many different places such as computer stores, department stores and online retailers. There are many retailers on the high street that stock wireless routers. The advantage of using a high-street retailer is that you can physically see the product before you purchase it. You can also ask the shop assistant for further advise on the product, how it compares to others and whether it is the right product for your broadband connection. The bad thing about trying to find the best wireless router in the high street is that high street retailers often stock only a limited number of wireless routers, therefore you will not have as much choice. Shopping for a wireless router online is often a better option – not only will you have far more choice but you are likely to find a better deal as well. When you are shopping online you can look at as many different makes and models of wireless routers as you want to. You can also look at several different online stores and compare the prices at each store. When shopping for the best wireless router online the best thing to do is make a note of the model number as you look at each wireless router. The model number is a unique identifier that will allow you to compare the price of that router across different online web stores. Does it have a modem – Some routers come with a built-in modem whereas others are advertised as a standalone router. You should first consult your broadband supplier to find out whether they provide you with a modem or whether you need a router that comes with one built in. Does it have a wireless technology supported by your devices – The wireless technologies that we talked about earlier are important, firstly because they dictate the maximum wireless speed of the router but also because they need to be matched by your devices. If you are using an older computer, then it is best to avoid routers that support the latest wireless standards and technologies because your device may not be compatible with them. Does it have the right features – There are lots of different features available when it comes to wireless routers. It is important to think about the features that you need and then look for wireless routers that include those features. So, there you have it – all the latest and best wireless routers on the market today, reviewed in every detail to make your buying decision much easier. We have looked at a cross-section of the market, picked out the best wireless routers for you and then categorized them in terms of their speed, performance and features. We have compared and reviewed each router to help you in deciding which router is best for your home wireless network. The important things to take away from this article are first that there are lots of different wireless routers out there and secondly that each wireless router has so many different features, so many different good and bad points. The truth is that every home network is different, every user’s requirement is different and so the best router for one person is not necessarily the best router for another person. The Best Wireless Router For 2018? We have decided on which is the best wireless router available on the market today. We based our decision on all the metrics that were listed in the table at the beginning of this article. We also based it on our own experience with using and reviewing each router. We made the decision after seeing how each router performed in the real world, what they were like to look at, how easy they were to set up and then how well the routers performed over time. The clear winner after all our testing and research was the Nighthawk AC1900 – produced by Netgear. This router ticks all the boxes when it comes to modern wireless networking. The router has a fantastic design, it looks powerful and it performs exceptionally well in terms of its bandwidth and speed. The thing that really stood out for us about this router was how well it worked under pressure. Lots of other routers suffered at some point from drops in connection, firmware freezes, and other issues but with the Nighthawk we did not face any such issues in the entire time that we were reviewing the product. This told us that the router is very well made as well as being extremely durable. Having said that, all the other routers that we reviewed are also exceptional models and although they each have their own negative points, they are overall the best wireless routers that you can buy today. So, we don’t want everyone to go out and buy a Nighthawk because of this article but rather to read through this article and pick the router that meets all your requirements. For example, some users will be looking primarily for speed and will pick the fastest wireless router, for example, the TP-Link AC1900. Whereas other users looking for best buy routers will perhaps pick one of the cheaper routers, for example, the Linksys WRT54GL. There may be other readers who are far more interested in the features offered in which case it would be best to pick a router that offers more features or perhaps more flexibility. Regardless of the features or assets that you are looking for in a wireless router, you can guarantee that whichever router you pick from this article it will be one of the best on the market today.